Atlantis teenager Eldrin Keyser started smoking Tik at the age of seven. 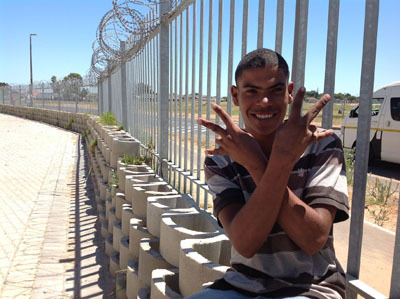 Now 18 and having dropped out of school in Grade 6, Keyser says he is likely to be recruited into one of the gangs fighting over territory in the impoverished area at the north west edge of the Cape Town Metropole. Loitering outside the Protea Park primary school premises this week with four friends who are in grade 8 at Proteus secondary school, Keyser said every day in Atlantis resembled a scene out of an action movie as rival gangsters shoot at each other in the streets in broad daylight. He said not long ago he saw a gang member shot in the head by a rival gang member. Gang groupings have infiltrated the area, he said. “We see life here like in an action movie,” said Keyser, with his four friends all wearing school uniform and smoking cigarettes during learning hours. One of the four learners, a minor, said he was addicted to cigarettes but at the school other learners were addicted to tik and dagga and owed allegiance to gang groups whose presence in the township is dominant. The boy said learners carried knives and even guns to school and when teachers scolded them they threatened to bring gangster friends to teach the teacher in question a lesson. The other three learners, also all minors, concurred. The situation is tense in Atlantis. Residents gave advice which areas to avoid due to intense gang fighting over territory. School Governing Body chair at Proteus secondary school Samuel Williams confirmed that gangsterism was seriously affecting learning at schools. Williams said when learners fought each other at the school they would inform their gang groups to which they owed allegiance and they would come and wait outside the school premises to enact revenge. “Sometimes the learners are friends with gangsters and when they (learners) fight each other at school they go and fetch their gangster friends…that’s where all the violence is emanating from,” said Williams. The school did not do body any search, he said. The school governing body was planning on approaching the City to request School Resource Officers (SROs). The SROs is a pilot project which was rolled out at six Cape Flats school situated in gang infested areas, where a Metro police officer is assigned to protect the school during school hours. Atlantis secondary school principal Charles Marthinussen said his school was surrounded by four communities: Island Place; Shelly Court; Neptune Castle and Avondale. Each community had different gang groups operating there and learners were simply “labelled” as affiliated to a gang depending on the area in which they lived. Simply walking to school meant many learners lives were in danger as they had to pass through ‘rival’ territories, said Marthinussen. Education MEC Donald Grant’s spokesperson Bronagh Casey said the WCED (Western Cape Education Department) was aware of “heightened gang violence in the area of Atlantis”. But Casey said this was outside of school premises. “There has only been one incident reported to the WCED of violence within schools. In January two Grade 11 learners were attacked by people outside the community when walking to class,” said Casey. The City in collaboration with the Western Cape Education Department (WCED) and Department of Community Safety rolled out the SRO’s pilot project at Chrystal High School in Hanover Park; Phoenix High School in Manenberg; Bishop Lavis High School in Bishop Lavis; Lotus High School in Lotus River; Sizimisele High School in Khayelitsha and Oscar Mpetha High School in Nyanga. The SRO’s were trained to provide law enforcement services to the participating schools, said Casey. Since the pilot rolled out in 2013, the WCED met the City last month to discuss the final assessment of the project which was due to be completed by the end of the month, she said. Feedback from the schools so far was “positive”. “We’ll be able to determine the success of the pilot project after the assessment, after which point we will see whether it will be expanded to include more schools,” said Casey. In the meantime Mayco member for safety and security Jean Pierre Smith said the City and the WCED were “in ongoing talks” about the expansion of the SRO project to other schools affected by gang violence, and the potential deployment of additional Law Enforcement staff. Western Cape Community Safety MEC Dan Plato said his department was running community programmes in Atlantis with religious organisations and Further Education and Training (FET) colleges to keep the “youth busy”. Plato said although his department programs was bearing fruit, gang violence was still escalating.